Valletta 2018 Foundation Chairman Jason Micallef speaks during the press event to launch the Carnival festivities for 2017. He was joined by the Minister for Justice, Culture and Local Government Dr Owen Bonnici, Festivals Director Ms Annabelle Stivala Attard, and Carnival Artistic Director Mr Jason Busuttil. 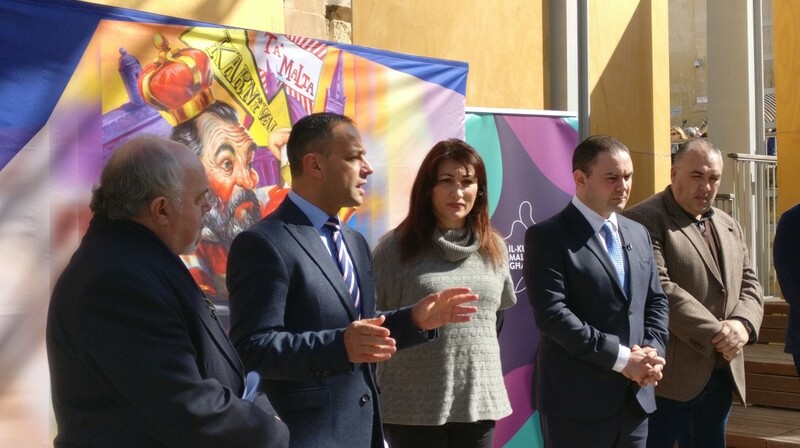 The programme for the Carnival celebrations was announced today during a press conference at Pjazza Teatru Rjal addressed by the Minister for Justice, Culture and Local Government Dr Owen Bonnici, Festivals Director Ms Annabelle Stivala Attard, Carnival Artistic Director Mr Jason Busuttil and the Chair of the Valletta 2018 Foundation Mr Jason Micallef. This year’s Carnival marks the beginning of making a dream come true for the Carnival participants – that of the Carnival Project. Work on the Malta Carnival Experience will start in the coming weeks after all necessary permits were approved by the Planning Authority. At the moment preparatory work is being carried out. The Artistic Director explained further on the Carnival Project. He added that in May Malta will also host the annual convention of the Federation European Carnival Cities, which will bring to Malta delegates from over 20 countries. This is the fourth time Malta will organise such an important event. This year’s Carnival, explained Jason Busuttil, is bringing back to life some old traditions which had fizzled out in the past years. These are mainly the participations of decorated carts and karrozzini as well as band marches. Satire is also on the increase. “Satire has increased a lot. Since Malta has the EU Presidency, we have a float dedicated to it designed by renowned cartoonist Steve Bell and constructed by the Maltese Carnival participants. Carnival is also spreading into other localities with presentations of the main activities also improving,” said Busuttil. Carnival will also be celebrated at the Science Interactive Centre in Kalkara thanks to [email protected] on Saturday 18th February 2017 and Sunday 19th February 2017 daytime. “Esplora believes that Science is an integral part of everything around us. One of the Centre’s aims is to try to help bridge the gap between Culture and the Sciences within the STEAM field. During [email protected] visitors will be able to experience short expert talks related to the physics, engineering and the mechanics involved to make a carnival float. Two carnival floats will be present on site. Two interactive walk-in workshops will also be offered where visitors will be able to paint on carnival masks, model with clay and explore the chemistry of clay minerals,” said Elton Micallef, Deputy Director for Education & Programme Development at Esplora. For more information, prices and opening hours please visit Esplora’s Facebook page: Esplora Interactive Science Centre. Carnival starts on Thursday 23rd February in Pjazza Teatru Rjal with an opening ceremony and speeches. Soon after there will be an exhibition of the competing costumes. The next day till the 28th of February there will be a defilè of floats, grotesque masks and dance competitions. For the first time this year, after Saturday’s activities which end round 8pm, there will be a street theatre performance – ‘B’Tal-Linja Jaqbillek’ in St George’s Square, Qarċilla, marching bands and an exhibition of decorated carts and karrozzini. After last year’s success, Ħamrun will celebrate Carnival on Sunday morning, with at least five bands marching along the streets accompanied by a number of floats. On Monday and Tuesday dance schools will parade in Valletta’s streets. Carnival will end on Tuesday night with the grand defilé in St Anne’s Street in Floriana. Carnival will also be celebrated in these localities thanks to their local councils: Zabbar, Għaxaq, Qormi, St Julian’s, Dingli and Naxxar. Seating will be available for events at St George’s Square. Tickets can be purchased online from https://www.showshappening.com/. The event will also be covered live on TVM on Saturday morning, Sunday from 2pm till 8pm and Tuesday from 6pm till 9.30pm. This year’s Qarċilla was penned by Immanuel Mifsud, produced by Joseph Galea and the witnesses for the wedding are Daphne and Glenn. This Carnival tradition, which its first reference dates back to 1760, was renewed four years ago by the Maltese Department (UOM). The street performance which visited Malta and Gozo on board of an old typical Maltese bus last summer will visit this year’s Carnivals in our capital cities. The cast includes veteran actresses Josette Ciappara and Mary Rose Mallia, with the latter being the bus captain. The script was written by Simon Bartolo and directed and produced by Sean Buhagiar. The performance will be held on Saturday 25 February at 9pm in St George’s Square and on Sunday 26 February at 3pm on Victoria’s Carnival stage. Artists together with residents from the DuwiBalli area will celebrate and narrate the way of living in this part of Valletta. The residents will collaborate with Italian artist Federica Terracina and Carnival veteran Godwin Scerri to create a merry atmosphere. The activity includes readings of original work by Jean Paul Borg, inspired from stories of people living at DuwiBalli. Photos taken by resident Osea Tabone will be exhibited in the street. All this will take place on Sunday 26 February at 8.30pm and Sunday 27 February at 10am. ‘Triq it-Taraġ’ forms part of ‘Ġewwa Barra’ – a Valletta 2018 Foundation community project. The performance is open to the public. 10am: Dancing School’s Carnival Parade followed by a dance show at Pjazza Teatru Rjal, Valletta.